Section 106 Process guidance for Local Public Agencies is presented in EPG 135.1 while guidance for MoDOT staff is summarized in EPG 135.2. Section 106 of the National Historic Preservation Act of 1966 requires potential impacts to significant cultural resources from any federally funded or permitted project to be considered. Cultural resources include archaeological sites, buildings, structures (e.g., bridges), objects or districts. The significance of a cultural resource is evaluated by applying a specific set of criteria that are set forth by the National Register of Historic Places. Cultural resources that meet the criteria of eligibility for listing on the National Register are referred to as “historic properties.” Failure to obtain Section 106 clearance could jeopardize federal funding and permits for a project. Section 106 encourages, but does not mandate, the preservation of historic properties. The goal of Section 106 is to ensure that preservation values are factored into the planning process for all federally funded or permitted projects. 3. Resolve adverse effects. Avoidance, minimization, and/or mitigation of any adverse effect on historic properties. Additional information on Section 106 is provided in EPG 136.6.4.1 Section 106 (Cultural Resource) Compliance. If the project does not meet the criteria for a project with “No Potential to Cause an Adverse Effect” as defined by the Memorandum of Understanding between the Missouri Division of the Federal Highway Administration and MoDOT, the LPA should solicit State Historic Preservation Office’s (SHPO) opinion on the need for a cultural resource survey by submitting a Section 106 Project Information Form to SHPO. Below are the steps to follow in the Section 106 process. A. Section 106 Project Information Form. B. If a bridge is present, provide information on the bridge’s original builder and the year built along with 3 in. x 5 in. or larger photographs (600 dpi if digital; photocopies are not acceptable) showing two views (side and end views), Google Streetview and similar images are NOT acceptable to the SHPO. SHPO will also accept digital photos on a CD, especially if there are lots of images of both bridges and/or buildings. Be sure to include the bridge number and feature crossed on the project information form! D.	A relevant portion of a United States Geological Survey (USGS) 7.5’ Topographic Quadrangle Map (1:24,000 scale) showing the location of the project and borrow sites is required. Maximum project (and/or borrow) limits should be delineated on the map, along with realignment of roadway if applicable. This map should show a buffer of about one mile beyond the limits of rural projects. An additional “close-up” view map of the project area may be necessary for small projects where the details are difficult to distinguish or for urban areas to better show adjacent buildings (aerial images from websites such as Google Maps and Bing Maps can be used for this supportive information). USGS 7.5’ topographic maps can be downloads from the University of Missouri's CARES Map Room. If there are any questions about the information that is going to be submitted, the SHPO should be called for guidance. Sending in inadequate information could result in a SHPO response of “Your submittal did not include adequate information to review your project …”, which will require a resubmittal with the correct information. The SHPO review process does not officially begin until they have an acceptable submittal. The SHPO 30-day review process starts over each time additional information is submitted. SHPO reviews the submitted project information and offers an opinion as to whether further cultural resource investigations are required. A.	SHPO reviews information and offers an opinion as to the need for a Cultural Resource Survey. SHPO has by law 30 calendar days to respond. If SHPO responds “no survey needed” or “no historic properties affected,” Section 106 requirements have been satisfied and no further Section 106 work is needed. The date of the SHPO letter would be used as the Section 106 compliance date. B. If SHPO recommends that a survey is necessary, a survey should be conducted using a cultural resource consultant or staff member (must meet the Secretary of Interior Standards) to identify historical and/or archaeological resources that may be affected by the proposed project. C.	If LPA does not agree with SHPO that a cultural resource survey is needed, FHWA shall be contacted to make a final determination on the need for a survey. If the SHPO requests a Section 106 survey the LPA will need to hire a qualified cultural resource consultant or staff member to conduct the survey and to submit a report of their findings to the SHPO. A. Cultural resource surveys typically are limited to the area of potential effects (APE) (i.e., for archaeology, this is the maximum footprint of the project consisting of proposed and existing right of way, and permanent and temporary easements) and any off-site areas, if known (e.g., borrow, staging, wasting, etc.). For architectural resources, the APE may include the limits of the project plus a buffer around the project area so indirect effects of the project are considered (usually 50 ft. in urban settings and 100 ft. in rural settings). For archaeological resources, the APE is the maximum footprint of the project consisting of existing and new right-of-way, and temporary and permanent easements. B. Reporting the results of the cultural resource survey should follow the SHPO Guidelines for Phase I Archaeological Surveys and Reports. The standard method to submit the results is the Section 106 Survey Memo. Directions in completing this memo are provided on SHPO’s website. Additional SHPO guidance on requirements for architectural surveys is posted on the SHPO website, including the Architectural/Historic Inventory Form that should be used for buildings that are believed to be eligible for listing on the National Register of Historic Places. C. The Section 106 submittal will be reviewed and commented on by SHPO. SHPO has by law 30 calendar days to respond. The SHPO comments only apply to the project as submitted. Any changes to the project may require a supplemental submittal to SHPO regarding these changes (e.g., project limits, significant modifications to the nature of the project, etc.). Any subsequent communication with SHPO should include the Project Number assigned by SHPO to the original submittal. If cultural resources are present, the LPA, in consultation with SHPO and FHWA/MoDOT, determines whether a cultural resource meets the eligibility requirements of the National Register. A cultural resource professional may need to conduct additional investigations to evaluate the eligibility of some resources. The cultural resource professional will need to consult with the MoDOT Historic Preservation staff on the proposed testing plan for an archaeological site before implementing it. A. The SHPO is requested to concur or disagree with the National Register eligibility of a cultural resource. The cultural resource professional should provide an assessment of resource eligibility. B. If SHPO, LPA, and FHWA/MoDOT agree that a cultural resource is not eligible for the National Register, the Section 106 process is complete. No further action is necessary. C. If SHPO, LPA, and FHWA/MoDOT agree that a cultural resource is eligible for the National Register, a determination of effect (Step 2c) is made next. If historically significant cultural resources are present, the LPA, FHWA/MoDOT, and SHPO will determine the effect of the project on each National Register eligible property (called a “historic property”). If the result of the survey is “adverse effect to a historic property” the LPA precedes with Steps 3 and 4. The Advisory Council on Historic Preservation (Council) must be notified of the adverse effect and be invited to participate in consultation for the development of a Memorandum of Agreement (MOA), through the submittal of an e106 form (see EPG 136.6.4.1.2 for instructions and the LPA Project Checklist for Projects that have an Adverse Effect under Section 106). If the SHPO concurs with the results of the Section 106 Survey submittal being “no historic properties affected” or “no adverse effect to a historic property,” Section 106 compliance is completed. The date of the SHPO letter would be used as the Section 106 compliance date. If historic properties will be adversely affected by the project, the LPA will coordinate with SHPO, MoDOT, FHWA and other appropriate consulting parties in preparation of a Memorandum of Agreement (MOA). Section 106 is not complete until an MOA is executed and the stipulations are completed. A. The MOA process is started by the LPA’s preparation and submittal of a draft MOA and the e106 form updated to include consultation that may have occurred on the project since the Council notification occurred, and an Alternatives Analysis (for bridge projects). The documents are forwarded to MoDOT Historic Preservation for review and comment. B. An Alternatives Analysis must be developed. C.	When the MOA is satisfactory, MoDOT will inform the LPA, SHPO and FHWA that it is satisfactory. If the Council has responded, the LPA can begin the process of signing the MOA. The LPA should prepare a copy of the MOA for each signatory. D.	If the adverse effects are to a Native American archaeological site, FHWA will provide a copy of the draft MOA and accompanying information to Indian tribes with historical interest in the project area or attach religious and cultural significance to the site to provide them the opportunity to participate in the consultation process. E.	The LPA will send the signed MOA to the SHPO, using text similar to the sample letter and copy MoDOT and FHWA on the transmittal letter. The SHPO will sign the MOA and forward it to the FHWA for execution, copying MoDOT and the LPA on the transmittal letter. The MOA is considered to be executed upon FHWA signature, who is the last party to sign the document (general signatory order is LPA, any other invited signatories, SHPO and then FHWA). Following the execution of the MOA, the LPA will implement and fulfill the stipulations of the MOA. Ultimately, the SHPO must concur that the stipulations of the MOA have been satisfied. A. Bridges and Architectural Resources: The LPA and FHWA consult with the SHPO to determine the level and kind of documentation required for the historic property: Historic American Engineering Record (HAER) documentation, Historic American Building Survey (HABS) standards, or a less formal state-level documentation. For most of these historic properties the state-level documentation is selected as the preferred method for recordation. By this point, public involvement has already been initiated to provide the public the opportunity to review and comment on project alternatives that involve a historic bridge. Generally bridges are advertised for availability and offered to interested parties for reuse in place or at an alternate location, or demolished if no one expresses interest. The transfer of ownership or demolition of the bridge occurs after the consultation on the level of documentation. The specific HAER/HABS guidelines can be found at National Park Service’s Heritage Documentation Programs (also, see EPG 136.6 Environmental and Cultural Requirements). If the SHPO recommends that the historic property be documented to the state level of documentation, the information required is available at EPG 136.6 Environmental and Cultural Requirements. B. Archaeological Sites: If the adverse impacts to a National Register eligible archaeological site cannot be avoided (e.g., changes in roadway alignment, fencing, and burial under roadway fill) the usual mitigation measure is data recovery (i.e. site excavation). Excavation activities are typically limited to within the project limits. If a site is excavated, a qualified archaeologist must conduct the field investigations, analyze the remains, and prepare a Phase III data recovery report. Artifacts from excavations are the property of the LPA and must be curated at an archaeological curation facility. If human remains are encountered during the excavation, SHPO must be contacted and the state burial law (RSMO 194) will need to be followed. Notification of the human remains should also be provided to FHWA and may need to be provided to consulting Indian Tribes. If Steps 3 and 4 are required, then the date that FHWA signed the MOA is used as the Section 106 compliance date. This article is a brief guide to Section 106 (cultural resources/historical preservation) compliance. A cultural resource is any archaeological site, building, structure (e.g., bridge), object or district. Not all cultural resources are historically significant, but all have to be considered. 3) Resolve Adverse Effects – Avoidance, minimization, and/or mitigation of the adverse effect on historic properties. 3) destroys, relocates, or encroaches upon a building(s) or other features on a property, including sidewalks, fences, gateposts, entrance gates, and walls that may be contemporary with the building. If a job does not meet this criteria in the design stage, but during construction or maintenance there is an activity that would meet one of these criteria the job can become a Section 106 undertaking. The cultural resources investigations are initiated through the Request for Environmental Services (RES). Early involvement by MoDOT’s Historic Preservation (HP) staff provides an opportunity to identify and attempt to avoid significant cultural resources, which will minimize the time and cost of addressing Section 106 concerns during the design process. 2)	The program or project includes all possible planning to minimize harm to the park, recreation area, wildlife and waterfowl refuge, or historic site resulting from its use. HP staff will develop the Section 4(f) Evaluation document, with sections created by the districts. The district design staff needs to provide design alternatives that avoid the Section 4(f) property and the cost of each alternative. It takes approximately 6 to 12 months to complete the Section 4(f) Evaluation process. 1) Screening/Recon – Background research that identifies known cultural resources in a proposed job area, which is usually conducted during the conceptual/location project development stage. MoDOT should identify historic properties that will require a Section 4(f) Evaluation1 before the Preliminary Plans are approved. If the district has concerns about a property possibly being historically significant, they should make the Historic Preservation Section aware of the property as early as possible. a) A Phase I survey (an intensive, systematic investigation to identify all cultural resources that may be affected by the proposed job) of the right of way and easement limits will be required. District staff will need to acquire landowner permission to allow MoDOT HP crews’ access to their portion of their property in the proposed project limits, and to photograph buildings on the property (Note: After the district has obtained the initial landowner agreement, HP staff can make follow-up calls if a property owner has specific questions, requests, or concerns). A Phase II site testing will be needed if any potential NRHP eligible archaeological sites are encountered. The Phase II is a limited archaeological excavation of a site to determine its significance and whether it meets NRHP eligibility criteria. A Phase II investigation takes approximately 1-2 weeks per site. b) If NRHP eligible resources are identified and will be adversely affected by the proposed job, a Memorandum of Agreement (MOA) spelling out mitigation measures and responsibilities is required. The MOA will be prepared by the HP staff and signed by the Federal Highway Administration (FHWA), MoDOT, and the State Historic Preservation Officer (SHPO) at the Missouri Department of Natural Resources. Indian tribes and other interested parties may participate in the development of the MOA. Tribal participation is initiated by FHWA. It will take several months to negotiate a MOA. If the adversely affected resource is architectural or a bridge, a Section 4(f) evaluation will need to be prepared. Information for an alternatives analysis will need to be provided by the district. A Section 4(f) Evaluation can take 6-12 months to complete for non-bridge resources. c)	The mitigation of the adverse effects to NRHP eligible resources (e.g., a Phase III excavation for archaeological sites) may take several weeks or months to complete the fieldwork. If the adversely affected resource is an architectural resource, the building will need to be photographed (interior and exterior) after it has been acquired by MoDOT, and it must be acquired with architectural features intact. The photographs must be approved by the SHPO before the letting date; a measured floor plan may also need to be prepared for the building. Job construction can proceed following the completion of the mitigation fieldwork. 3) Special Provisions – Some jobs may require special provisions to the construction contract to address cultural resources concerns. These provisions may guarantee that the stipulations agreed to in the MOA will be completed before the NRHP eligible resource(s) is/are adversely affected by construction, or to protect cultural resources from collateral damage that may occur during construction (e.g., monitoring construction or avoidance of certain areas within the job boundaries). The HP staff will draft the special provisions. The cultural resources investigations can be initiated through a Request for Environmental Services (RES) submitted to the HP Section of the Central Office. Early involvement by MoDOT’s HP staff provides an opportunity to identify and attempt to avoid significant cultural resources, which will minimize the time and cost of addressing Section 106 concerns during the design process. During the Preliminary Plans stage and after the district has obtained land owner permission for the HP fieldwork, HP staff should identify any historic properties, assess the project’s affects upon them, resolve any adverse effects, and obtained SHPO’s concurrence with MoDOT’s finding (i.e., the standard Section 106 process). HP staff should also identify any historic Section 4(f) properties. By the Right of Way Plans stage, HP staff should have completed the standard Section 106 process (the preferred method) or notified FHWA and SHPO that a “Phased” Section 106 process is being used. 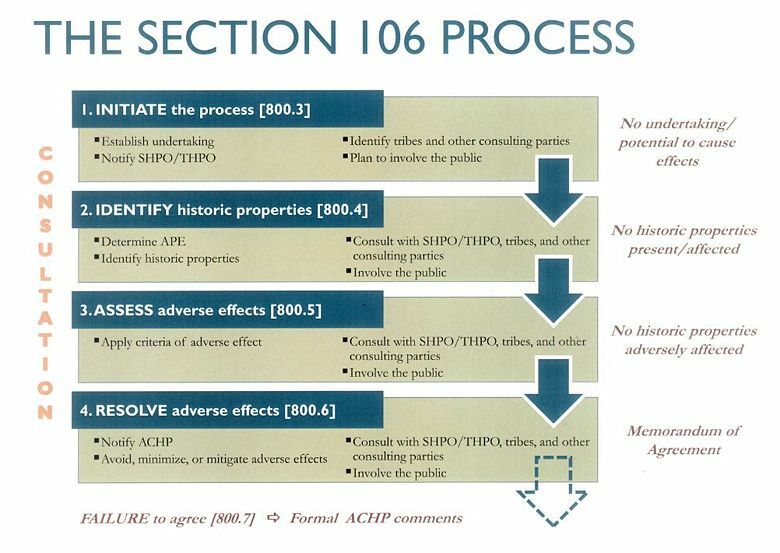 The "Phased" Section 106 process is used when access to enough property is restricted to prevent a standard investigation to complete the Section 106 process before the ROW stage of project development. This allows the release of federal funds for the purchase of properties with MoDOT making a commitment to complete the Section 106 process, which might lead to selling previously acquired property and the purchase of additional property in able to avoid an adverse effect to a historic property determined later in the project development process. An A-date for property acquisition can be set upon SHPO accepting the initial Phased Section 106 submittal or by SHPO not responding within 15 days of their having received the submittal. By the completion of the Final Design stage, the “Phased” Section 106 process should be completed if being used. By meeting these milestones, the HP staff should have opportunities to identify and attempt to avoid significant cultural resources, not delay purchase of right of way, and complete the Section 106 process well before the job's plan completion date. Detailed information regarding this flowchart can be found at the Advisory Council on Historic Preservation's website Section 106 Regulations Flow Chart. MoDOT’s responsibilities under Section 106 are explained at EPG Historic Preservation. Most borrow and excess material areas are “contractor furnished” with the contractor responsible for attainment or disposal of the necessary materials and compliance with all environmental responsibilities. Typically, the contractor will submit the Section 106 Project Information Form to the State Historic Preservation Office (SHPO). The SHPO has a maximum of 30 days to review this information. The formal SHPO response consists of a letter indicating that no cultural resource survey is required for the identified area or that a cultural resource survey is required. If a survey is required, the contractor may engage a cultural resource firm to conduct the work. Further guidance for hiring a qualified cultural resource consultant may be found at: http://www.dnr.mo.gov/shpo/consultants.htm. Lists of firms qualified by the SHPO can be found on that web site. If asked by a contractor to provide the names of cultural resource contractors, it is important to refer them to the SHPO list and not provide the name of specific firms. For additional information, contractors needing cultural resource help can contact the MoDOT Historic Preservation Section. In certain cases, MoDOT staff will designate preferred borrow or excess material areas. In these cases, MoDOT usually has obtained Section 106 concurrence for use of the area. For MoDOT to obtain Section 106 clearance for a borrow or excess material area, the project manager should submit an RES with the proposed areas indicated on a topographic map to Design. The time line for MoDOT to obtain Section 106 should allow enough time for MoDOT to conduct the field investigations (if needed) and the SHPO to review and comment on the recommendations (by law the SHPO has 30 days to comment). This page was last modified on 5 January 2016, at 09:20.